My baby is flying solo today! 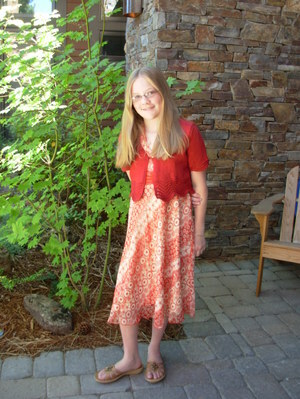 Chloe has a friend in California who is having her Bat Mitzvah this Saturday. At first we thought we'd make it a family trip, or have Mark take her down there on a business trip. 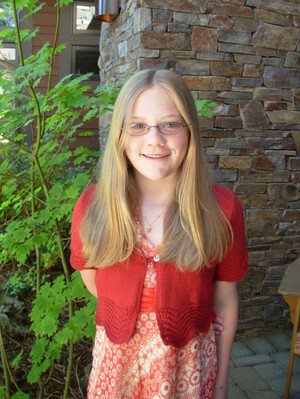 When I got my diagnosis, we knew those solutions wouldn't work, so she's flying on her own. She is very confident about it all, so I'm not too worried, but you know, I'm a mom! Luckily I finished this little number just in time. 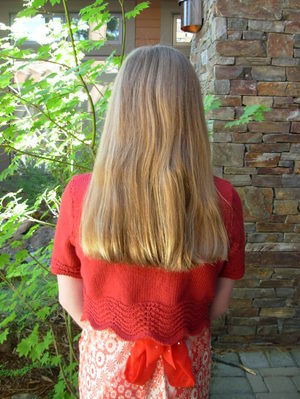 This is a sweater from Louisa Harding- Beachcomber Bay Design Collection. 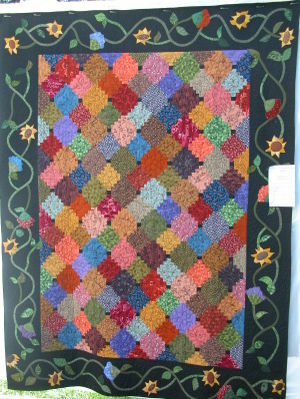 It's made with Rowan Calmer on size 7 needles (6 for edgings where it calls for a smaller needle). I like the feather and fan lace at the bottom edges. I finished setting in the sleeves last night while listening to a great thunderstorm and watching a crazy Craig Ferguson movie. Thank goodness it was done it time. Now she's on her way and I'm spending the next few days resting about the house. More of something to come next week. A nifty tool and a Halloween project! 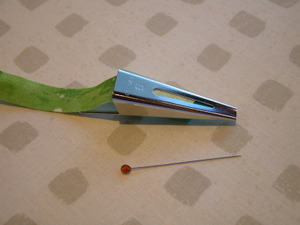 I mentioned this tool for making bias stems after my quilt class at the Sisters Quilt Week, and promised I'd show how easy it is to use. My photos are not that great, but bear with me and hopefully it will make sense. 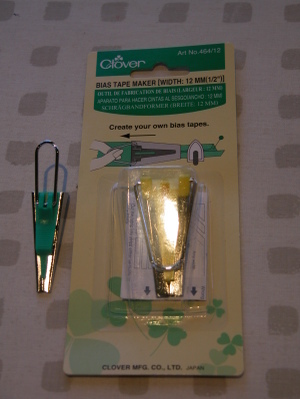 First of all you have to get yourself a Clover Bias Tape Maker. I will be using the 1/4 inch size on the left, but I also bought the 1/2 inch size still in the package. 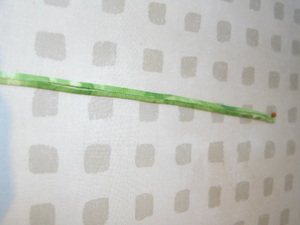 Notice the very narrow opening on the tapered end. When I tried this several years ago, the tape maker I got had a huge opening on the tapered end. I'm still not sure what it was designed for, but it was a pain in the neck to use. 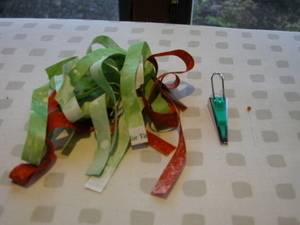 Now, for the 1/4 inch size tape maker, cut yourself a pile of stems 1/2 inch wide. These are cut on the cross grain (selvage to selvage), though mine are not all the way across 45" of fabric. Also get a long straight pin, ironing board and your iron. When you turn over the tool you'll notice this nifty slot. 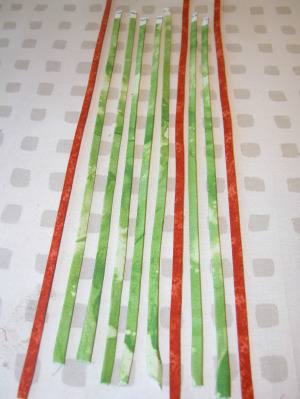 Put the fabric right side up into the opening at the large end and use your pin to slide the fabric forward so it starts coming out of the tapered end. Now, turn over the tool so the green side is up. 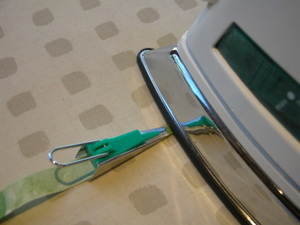 Place the pin into the folded little end that comes out and pin it securely to your ironing board. 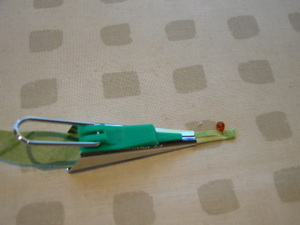 With a hot iron (I use steam) pull the tool out a little bit, just so the tip of the iron can fit in the space between the pin and the end of the tool. Very gently pull the tool (using the little handle if you need to) away from the pin and at the same time moving the iron right along at the tapered end. This is a quick, but smooth movement. You don't want the tool to move too far from the iron or the fold will come undone. This is a finished one. It took less than 10 minutes to make all of these. Now what do you think I was doing with all these? 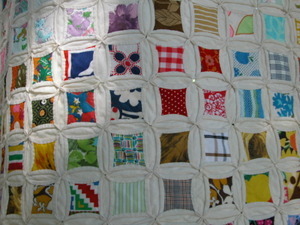 I took a cue from Tonya at Lazy Gal Quilting. Her Blooming Horrors quilt struck a chord and I couldn't wait to try one of my own. 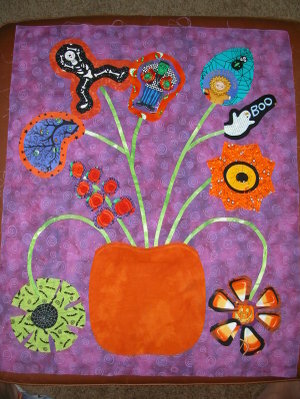 I have a whole set of bright Halloween fabrics that I'd been waiting for the perfect project for. Now, here notice the different shapes of the stems. I first made the straight and lightly curving parts and then wondered how curvy my non-bias cut stems could go. As it turns out those deep curves on the bottom were no problem. Tonya wasn't happy about cutting 45 degree bias stems and I suggested just cutting them on a smaller angle. Well, as it turns out you can just try the cross cutting method and see how it goes. I'd start there again before cutting any deep angles. And here we are mid stream. I spent my weekend on this and had a marvelous time. 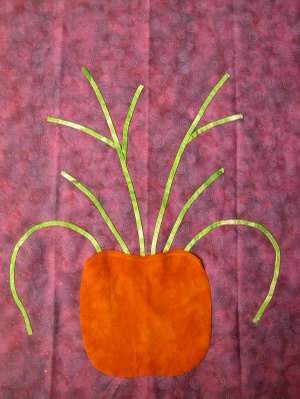 I have some of the flowers stitched down and am open to making changes. I'm sure it will evolve more as we go. One thing I do plan to do is to make a jack o lantern face on the pumpkin. Enjoy! Thank you for all the comments about my health situation. I really appreciate all the good thoughts, prayers and wishes headed my way. All this positive energy has got to be good for something. On my in between weeks I feel really good. I feel like I've got back almost all my energy. I think this bodes well for the next three treatments and I have been sewing again! I spent the weekend working on a little project that made me very happy and I'll post it soon. 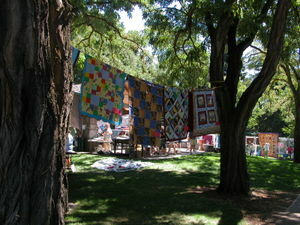 Today I want to show you photos from my quilt guild's show on Saturday. 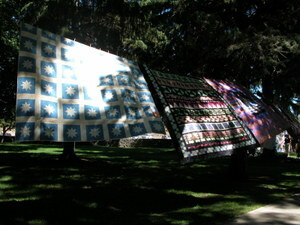 This is the first time I've ever attended and though I didn't have a quilt in the show I really enjoyed it anyway. I was actually interviewed by the local paper and got my comments in the article yesterday. Remember to click to see the photos bigger. This cathedral windows caught my attention right off. It's gorgeous! Look at these close-ups. 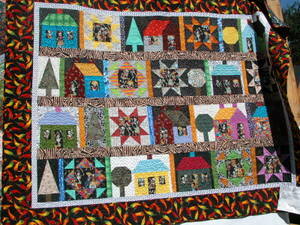 This is a Day of the Dead quilt and, of course, it has houses so how could I pass it up? I liked the way this is put together with the small diamonds of the stars, bigger diamonds on some hexagons such as the light blue one on the lower left, and solid hexagons like the gray one in the upper right. I also like the scrapiness. This one made me happy! 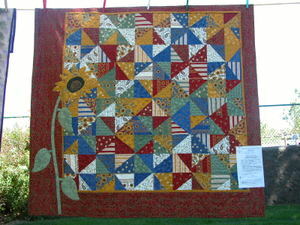 I love the sunflower and the asymmetrical borders. 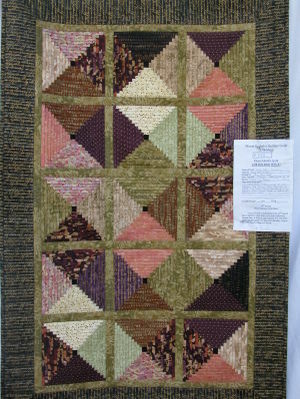 This one you've seen before in my report from the Sisters Quilt Show, but I like it a lot and voted for it for Viewer's Choice. I like this arrangement of log cabin blocks and the scrappy nature. I love all things Santa and had to take a photo of this one. 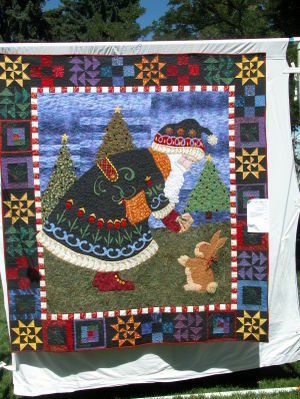 I especially like the folk art applique on Santa's suit. She said this was designed from a Mary Engelbreit image. I also see hints of Jan Brett, one of my favorite children's illustrators. This one is made from a folded fabric technique that doesn't use batting. It's just very heavy all by itself. 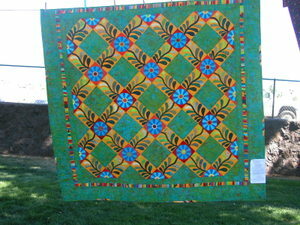 There is a local quilter, Sarah Kauffman, who has come up with the technique. She taught a workshop for our guild, but I was unable to attend. I'd like to try it sometime. 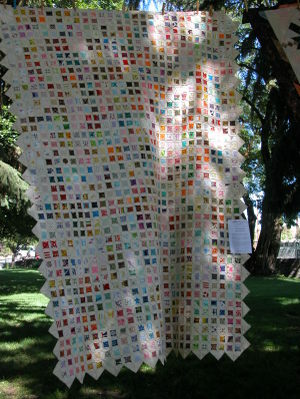 This one may have been in the Sisters Quilt show too, come to think of it. 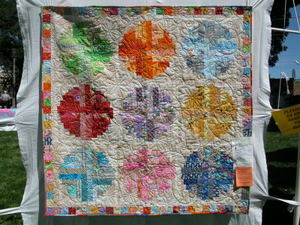 I still like this color palette and the applique border. 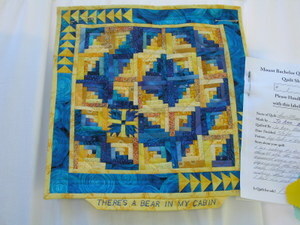 One of the special exhibits is this blue and yellow challenge that I believe I mentioned I was going to participate in. 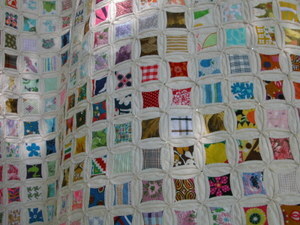 Well, I had just gotten my quilt basted for hand quilting when I got my diagnosis. I just lost interest for a while and figured I wouldn't have time to work on it anyway, so it's still unquilted. I did enjoy seeing what others came up with, but have to say mine would have given them a run for their money! This little mini was my absolute favorite. It's only about 1 foot square and I love the humor. This one was also part of the challenge. 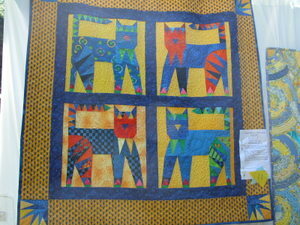 I love the colors and the patterning on the cats. 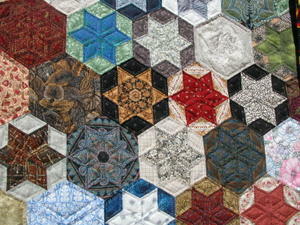 It looks like paper piecing to me which I will never do again, but I can still take inspiration from it. Well, that's it for now. I have a little technique and tool to show next time along with my newest project. I've decided to do the things that make me happiest and this one fit the bill, thanks to Tonya (and yes, that's a hint!). Well, I've waited so long to reveal what's been keeping me down lately, but can't put it off any longer. Life has thrown me a whole lot of lemons since early July when I was diagnosed with breast cancer. It's been a very difficult month and a half and pretty much ruined the summer. After multiple doctor visits, tests and a sentinel node biopsy the news is as good as it could be. It's early (though at stage 2 not as early as I would like it) and there are no lymph nodes involved. I started chemo last week which is the reason for the long delay in posting. I've been tremendously lucky to have the full support of my family and friends both near and far. 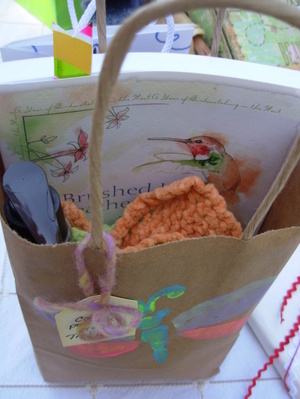 In fact, the most incredible gifts have come pouring in including many hand made items. 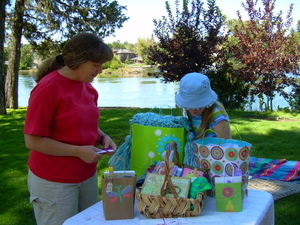 The photo above was taken at the park one day a few weeks ago when my homeschooling group presented me with all these gifts from those present as well as from far away friends. My friend, Jenn, organized this and totally blew me away. 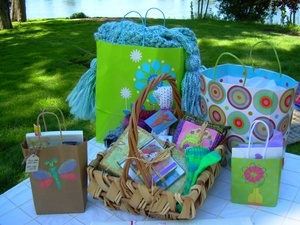 This Healing Basket includes gifts from members of Imagination Tribe. I've mentioned IT here before. 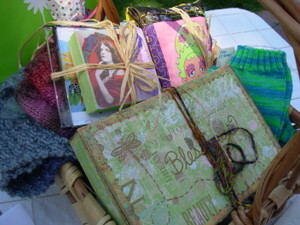 It's an online group of very creative people and we do swaps of ATC's and other things. It's such a great group. I've met many of the members at homeschool conferences so it was such a special thing to see it all put together in this Healing Basket. You might notice some lovely knit items there. I've taken more close up photos to share, but I think they are on the camera that Chloe took to camp this week, so I'll post them later. 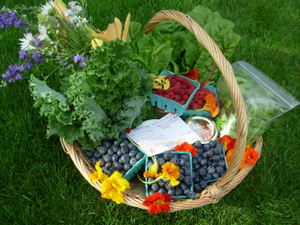 Also, that beautiful basket of produce in one of the more recent posts was given to us by another local friend. I couldn't help but take photos of all that luscious color. I plan to keep this blog going, but posts could be sporadic in the next few months. I do love to share and have been able to keep knitting and will be doing a little bit of sewing as well. I'd rather not make this a cancer blog, but some things may come into the conversation occasionally. One thing I can say for sure is that going through this has allowed me to slow down and really notice the little things. I've spent more quality time with my family lately and I've also reconnected with old friends through email and letters. Perhaps it's a blessing in disguise. I've decided to make some lemonade with all those lemons, so join me here in celebrating all the good things in life, good friends, good art, good love. Sorry it's been so long since posting. I do have a good reason and will talk about it next time. First I want to show you what I did on my summer vacation. When I was thinking about which knitting to bring with me to New England I happened to pick up my partially completed Charlotte's Web. As it turned out, knitting it was just as fun the second time. I don't really know why I put it down in the first place. This kept me busy through the long plane flight and during the first few days we were on Cape Cod. I finally got a photo of it just as we were getting ready to leave this wonderful spot. This is where I sat many afternoons to knit and gaze out at the water. 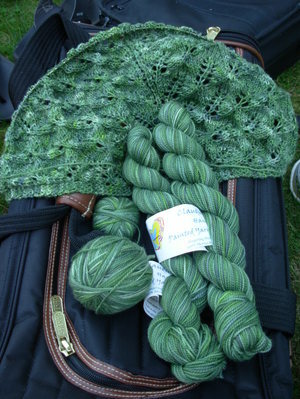 My Charlotte's Web is knit with 5 shades of Koigu in a gradation just as the pattern intended. The color change is hard to see here but it goes from pink at the center top to purple at the bottom edges. As you see it here it's unblocked (it's still unblocked at home too, must get to that!). The pattern calls for putting fringe all along the bottom edges. I'm still debating that as I like the look of this way and don't particularly like fringe. I'll try to get some better photos after blocking. While I was in Falmouth I took a little trip to the downtown yarn shop called Sage and found some gorgeous Claudia Handpainted yarn in this incredible green and started another shawl. The comfort of a simple lace pattern that I could memorize what just what I needed. I started this one just about as soon as I cast off the Charlotte's Web. 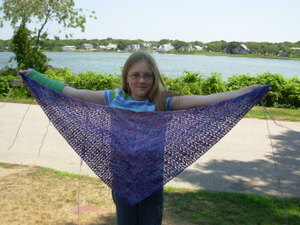 This pattern is Kiri and is a free pattern available here. It's based on Birch which is a Rowan pattern. This one kept me busy right through the second part of our trip and it's now waiting to be blocked too. The crazy thing is that I didn't stop there. The second part of our trip was to Squam Lake in NH which just happens to be not very far from the Keepsake Quilting and Patternworks extravaganza in Center Harbor. I go there every time we get up to Squam and it's almost overwhelming all the stuff there is to look at. 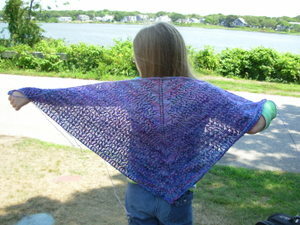 I went to Patternworks specifically looking for more Koigu to make yet another shawl. I haven't started it yet, but I got some gorgeous shaded solid red that I plan to make the Flower Basket Shawl with. It's all a comfort thing for me and you'll see why in the next post. Ex Goat Milker, Dani! Congratulations! It pays to de-lurk. Dani says she's been a lurker for a year- wow! I'm glad you finally made yourself known. I took a look at Dani's blog and she's got some really cute crochet going there. I especially love sweet Wonky Bear. Dani, I'm not sure how to email you on your site, so when you see this post please email me with your preference for a prize and your mailing address. It looks like you might prefer yarn, if so please let me know if you have an particular fiber content that you like best. Thanks to everyone who participated and sent so many good wishes. It really means a lot to me. I have really enjoyed sharing my work and it's been great that so many of you share yours as well. Blogland is a wonderful place!